Convert light intensity variations to sound. This detector can be used as a snooping tool for listening to light sources. The detector/amplifier circuit is a window to a world of 'noises' that exist in the ambient light that surrounds us. Fluorescent light fixtures, TV sets, computer monitors and street lights all have a characteristic sound. Daylight has a white noise (what else) hiss. Strobe lights are especially interesting. By using this concentrator I can "copy" the click of strobe lights on communications towers 22 miles away in broad daylight, even though I can't see them! The incandescent obstruction light on a tower about 3 miles away has a slow "swoooshhhhh - swoooshhhhh - swoooshhhhh" sound. An airport beacon 2 miles away has its own characteristic sound. Lightning? Astronomical objects? What would the moon sound like? How about a meteor? Or a meteor shower? Give it a try, but don't point that thing at the sun! The circuit, shown in Figure 1, employs a readily available phototransistor and audio amplifer IC. 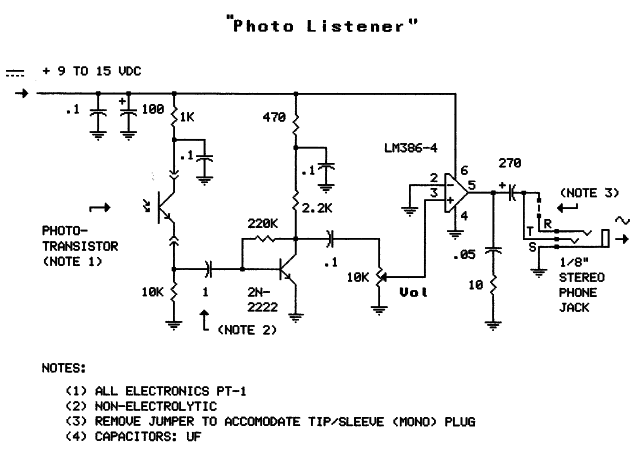 Virtually any phototransistor should work in the circuit, including ones available at Radio Shack, where you can also pick up the LM386 audio amplifier. A better (cheaper) source is All Electronics, where all of the components for the circuit can probably be bought for under $10. The circuit is probably most easily constructed on a small piece of perfboard, which can then be installed in a plastic box. The output of the detector/amplifier can be connected to headphones, speakers, or the line input of a computer or recorder. greatly increases photo-detector sensitivity and directivity.